People who want to enjoy the luxury camping experience of a lifetime are sure to love staying at Pomport Beach. The site is set on the edge of a tranquil lake, while guests will also find plenty of amenities just a few paces from their modern and spacious mobile home. 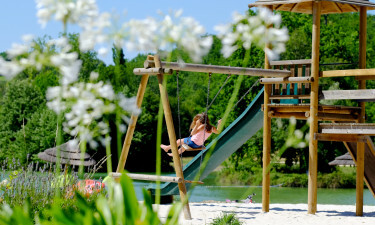 Pomport Beach is perfectly situated for people who want to spend plenty of time exploring the picturesque Dordogne region of France during their camping holiday. 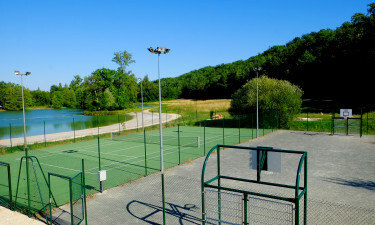 However, there is also an excellent range of activities and amenities available right on the site for guests to make use of. One of the most impressive features of Pomport Beach is the huge water park, which features waterslides, a Jacuzzi and a smaller pool for the little ones. Those who simply want to swim laps will also be able to make waves at the indoor pool. A large lake can be found at the edge of this leading LuxCamp and this is a great place to take part in a wide range of different types of water sports. The lake is fringed by stretch of golden sand where guests can soak up the sun.